In the words of Winnie the Pooh, “It is a blustery day!” And, blustery days call for comfort food and I have just the recipe to share with you today! 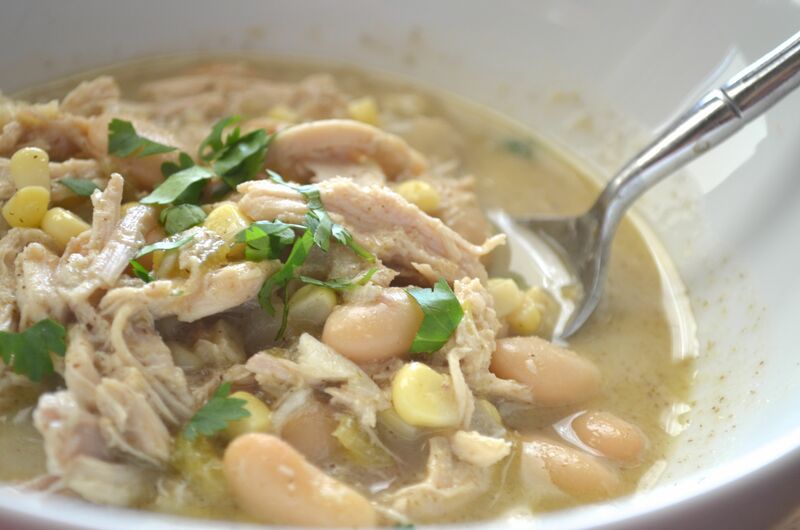 Slow cooker or stovetop – I’ve tried it both ways and it’s fabulous! 1. SAUTE onions and garlic in oil in large pot over medium-high heat. Add chicken and brown five minutes. Transfer mixture (or not) into 4-quart slow cooker. Stir in remaining ingredients. 2. COVER and cook on low 4-6 hours (in slow cooker). Uncover and cook 1 hour longer, stirring occasionally. IF using stovetop, just cook and simmer on low until chicken is cooked through. Garnish with fresh parsley or cilantro! Makes 10 small servings; about 4-5 “real” servings! Erin, I eat G-Free also! Tobi, have a lovely Chicken Caesar Salad – that sounds delic’ too!!! I LOVE this soup! I also have a version that calls for an 8 oz package of cream cheese that thickens it up a bit. So good on a cold day!! Cherie, ah, the cream cheese sounds like a great idea – I will definitely try the next time! Karrilee – we are “real” people in this house who like food!! !